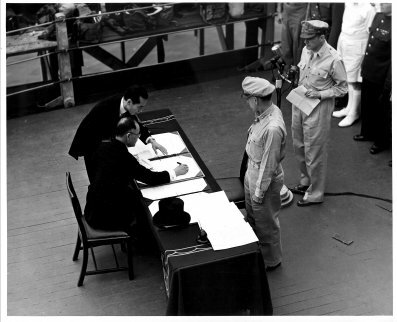 On September 2, 1945, surrender documents were signed by Mamoru Shigemitsu (Japanese Foreign Minister) and General Yoshijiro Umezu (Chief of the Army General Staff) aboard USS MISSOURI (BB 63), officially ending World War II. The official ceremony lasted less than half an hour. The event brought closure to a war that had delivered death and destruction to millions around the world. But it also opened the door to a new future for the United States; not only as a superpower, but also as a defender of liberty around the world. That status became a legacy that has endured to this day. Coincidentally, Operation Iraqi Freedom ended just two days ago. Our troops are returning in victory too, albeit without the fanfare and spontaneous celebration witnessed 65 years ago. But their accomplishments are no less significant. Both conflicts were fought against enemies who disregarded accepted rules of war in favor of brutality, torture, and suicide attacks. Both victories resulted in a change in leadership from a dictator to a representative form of government. 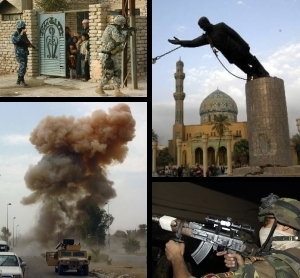 Both Japan and Iraq were shepherded from total defeat to democracy by U.S. military leadership. Both victories, of course, were won through the sacrifice, blood and toil of our magnificent armed forces. One can only hope that another parallel takes hold. Iraq sits at a fork in the road. One path leads to prosperity, international respect, and a brighter future for its citizens – the same path chosen by Japan. The other leads to more destruction and bloodshed. The young republic has been handed the reins – now it has to choose which direction to travel. To those who fought or participated in the war effort during the World War II, we can never repay you or thank you enough for what you did. You will always have our admiration and respect. To the men and women who were a part of Operation Iraqi Freedom, we owe you the same gratitude and acknowledgment for your spectacular accomplishments. To all of you, well done. You are our heroes of the week.